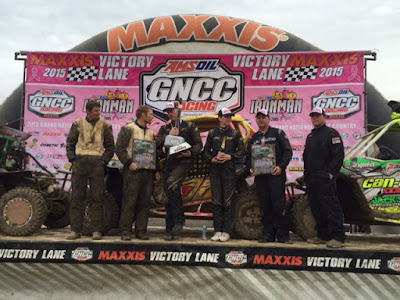 Amsoil GNCC Racing presented by Maxxis 2015 season came to an end with the “Iron Man” this past weekend in Crawfordsville IN. Carrie Jo Combs Russell and her GNCC staff must share our pride in the continued success of the series and the substantial growth in the program. The Tire Ball® Company (TBDC LLC) affiliation with GNCC goes back over a decade and the 2015 season became another banner year for the Tire Ball® product. ​Tire Ball® Athletes swept the podiums at “Iron Man” for the ATV 4×4 Pro Class, ATV XC1 Pro Class and the UTV XC1 Pro Class. As in the previous decade, podium sweeps continue to be a common occurrence throughout the 2015 season. Tire Balls® sponsored ATV XC1 Pro Walker Fowler also achieved the 2015 GNCC Championship which included 7 wins of the 13 round series. Tire Balls® sponsored UTV XC1 Pro Kyle Chaney sealed his 2015 Championship with a solid 4th place finish at “Iron Man” and 3 wins for the season. ATV 4×4 Pro Class champion Bryan Buckhannon secured the 2015 Championship riding Tire Balls® and had dominated the class throughout the 13 round series. Tire Balls® has been winning global championships for over a decade. What’s holding you up? Originating in Crestwood, Kentucky, Tire Balls® started back in 2003 providing virtual run-flat solutions to off-road racing communities for motorcycles, ATV/UTV’s, and side-by-side vehicles.